Whether you manage a medical facility, food processing plant, or an office building, cross-contamination should be a major concern. While healthcare facilities usually understand the importance of preventing contamination, other industries are often less fastidious, creating the possibility for germs and pathogens to infect their staff and visitors. This is why it is so important to follow cleaning procedures that minimize cross-contamination, control germs, and fully sanitize your facility. When cleanliness is your concern, microfiber should be your material of choice. Learn why in this week’s blog, below. Microfiber towels and mops are absorbent and anti-bacterial. When compared to a traditional mop, a microfiber mop is able to absorb up to 30% more liquid. Thanks to the millions of tiny fibers that make up microfiber material, it is incredibly absorbent, which means spills are mopped up efficiently and floors can be cleaned in a single pass, minimizing the risk of spreading germs and pathogens. Unlike traditional cotton, microfiber has the ability to remove 99.4% of bacteria from smooth surfaces using nothing but water. This can greatly reduce the amount of chemicals needed to keep your facility clean, which also means that you will spend less money on associated cleaning costs. 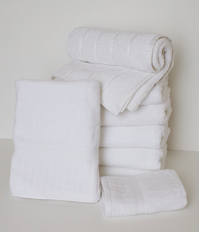 The naturally anti-bacterial properties of microfiber makes it the ideal material choice for both mops and towels. By renting your microfiber towels and mops, you can ensure that your facility will stay clean and sanitary. You can trust that a professional towel and mop rental service will understand how to clean your sanitation products so that they will be as good as new every single time you use them. No matter what type of facility you manage, your location will surely see many benefits when you choose to switch to a microfiber cleaning system. This entry was posted on Thursday, April 14th, 2016	at 9:03 am	. You can follow any responses to this entry through the RSS 2.0	feed. Both comments and pings are currently closed.